Mitsuko Uchida, one of the greatest Mozart interpreters of our time, shares a long-term collaboration with the MCO, focused on Mozart’s piano concertos. Mitsuko Uchida leads the orchestra from the keyboard. The partnership brings Mitsuko Uchida and the MCO to major venues and multiple-concert residencies across the world. It kicked off in January 2016 with an extensive European tour with 5 concerts in Spain (Alicante, Valencia, Barcelona, Oviedo, and Bilbao) and further performances in Luxembourg, Salzburg and Frankfurt. Each concert included two piano concertos paired around Mozart’s Divertimento K. 137, led by the MCO’s concertmaster. The tour concluded with a chamber music concert with Mitsuko Uchida in Frankfurt. In Autumn 2016, Mitsuko Uchida and the MCO toured Japan. This tour culminated in in a residency at Tokyo’s Suntory Hall on the occasion of the landmark venue’s 30th anniversary. Mitsuko Uchida was featured with a Mozart cycle in the in the opening series of the hall in 1986. In Spring 2017, the MCO and Mitsuko Uchida performed in Perugia, Treviso, and in Hamburg’s newly-opened Elbphilharmonie. 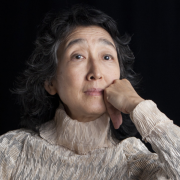 In Spring 2019, Mitsuko Uchida and the Mahler Chamber Orchestra reconvene for a series of concerts in Europe and the United States which will launch long-term residencies at the Salzburg Festival, at London’s Southbank Centre and at New York’s Carnegie Hall. A superlative interpreter of classical, early romantic and second Viennese School repertoire, Mitsuko Uchida performs with the world’s most respected orchestras and conductors including Cleveland, Chicago, Berlin Philharmonic, Royal Concertgebouw, Bayerischer Rundfunk, London Symphony, Philharmonia, London Philharmonic, Mariss Jansons, Riccardo Muti, Sir Simon Rattle and Esa-Pekka Salonen, Vladimir Jurowski and Andris Nelsons. Since 2016, Mitsuko Uchida is Artistic Partner of the Mahler Chamber Orchestra, embarking on a five -year project together. She also appears regularly in recitals in Vienna, Berlin, Paris, Amsterdam, London, New York and Tokyo, and is a regular guest at the Salzburg Mozartwoche and Salzburg and Edinburgh International Festivals. Mitsuko Uchida records exclusively for Decca and her extensive discography includes the complete Mozart and Schubert piano sonatas. She received a Grammy in 2011 for her recording of Mozart concerti directing the Cleveland Orchestra and in 2017 for an album of lieder with Dorothea Röschmann. Her recording of the Schoenberg Piano Concerto with Pierre Boulez and the Cleveland Orchestra won four awards, including The Gramophone Award for Best Concerto. A trustee of the Borletti-Buitoni Trust and Director of Marlboro Music Festival, in 2015 Uchida was awarded the Golden Mozart Medal from the Stiftung Mozarteum in Salzburg and the Praemium Imperiale from the Japan Art Association. She was awarded the Gold Medal of the Royal Philharmonic Society in 2012, and received an Honorary Degree from the University of Cambridge in 2014. Mitsuko Uchida was made a Dame Commander of the Order of the British Empire in 2009.